This 210 foot tall (64m) tower in North Beach is the best vantage point in San Francisco, and a great way for new arrivals to get their bearings. The art deco tower is the centrepiece of Pioneer Park, and was a bequest of Lillie Hitchcock Coit with the intention of adding beauty to the city she has always loved. Visitors should come early as the 360 degree views and wonderful photo opportunities make this a must-visit site and it gets crowded during peak times. The hill is accessed via Lombard Street, itself a very popular attraction. 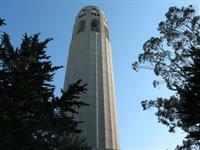 Transport: Muni’s 39 Coit bus travels between Coit Tower and Fisherman’s Wharf. Admission: $8 for adults and between $2 and $5 for children. Concessions available.